The Daily Undertaker, The Variety and Importance of Ritual The Daily Undertaker: "We were all dreading it, but it was an amazing day"
"We were all dreading it, but it was an amazing day"
"It was an amazing day." How often do you hear a funeral described this way? Actually, I hear this kind of sentiment quite a lot after funerals. No one looks forward to attending a funeral, but when it is an appropriate tribute to the person we have lost, when friends and family participate in ritual and remembrance, the results are moving and uplifting. No service or expression of sympathy can take away the pain and grief of loss, but the presence and participation of friends and family demonstrate to us that our loved one is missed by others too. Their support acknowledges that this life had meaning, and its departure is a serious and important loss felt by many. The rituals we follow can be old, newly made, or a combination of the two, like a motorcycle procession. In any case, participating in them is a public expression of the importance of this event and helps us to accept and work through our grief. The acknowledgement of our situation, the remembrance and tribute to the unique personality of our loved one, and participation in rituals that are relevant to us and the spirit of the deceased,can all have a wonderful and meaningful effect on us. That is what funerals are all about. 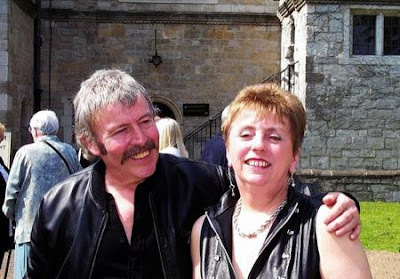 Just days after battling out of hospital, Fay Vercoe, of West Kingsdown, paid tribute to husband Mike as she laid him to rest on Friday, following the smash in Italy. About 250 bikers from across Europe followed his coffin, carried in a motorbike sidecar, from a Farningham pub to the funeral of the well-loved 66-year-old, known affectionately as Mad Mike. In her first interview, 62-year-old Mrs Vercoe, who only left Darent Valley Hospital last Tuesday, said: “Going to Mike’s funeral was a goal I was determined to hit, it was the least I could do for him.